A man I know, a reputable lawyer in Japan, was renovating his ancestral home when a samurai sword was discovered in the space above the ceiling. Shortly after WWII, when the Americans occupied Japan, samurai swords were banned and the Americans were wantonly confiscating and destroying them. Many precious heirlooms were hidden in walls and above ceilings to be forgotten. It took years of lobbying to get the Americans to understand that the swords were not just weapons but items of great cultural value and the many of them were irreplaceable. The Americans grudgingly enacted strict licensing laws for people who really wanted to keep their swords. Those laws still remain on the books and over the years they have become even more strict than before. So, when my friend the lawyer found a sword, carefully parceled in silk cloth and sealed in wax paper, in his old house, he immediately ordered it destroyed. He did not even bother to have it appraised to see what it was worth. He could not afford the repercussions that might ensue if somebody accused him of holding an unlicensed sword. His ancestors, long gone, took great risks to conceal the sword from the American occupation forces. They might have even risked their lives. His had been a wealthy family for generations. Richer, in fact, in the generations past. The sword was probably valuable. It could have been an heirloom that proved his linkage to an ancient nobleman. But he destroyed the sword anyway. The lawyer had seen too much sword trouble with the authorities. Hundreds of irreplaceable swords are still being destroyed this way each year. The cultural heritage of Japan is being broken and shattered sword by precious sword. And nobody is doing anything about it. This practice needs to stop and soon. 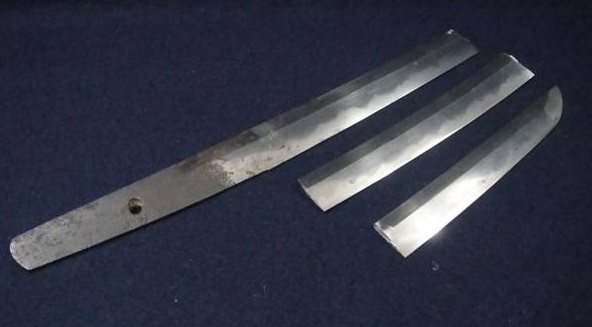 Internet auction sites are full of swords cut into legal sizes. Aficionados like to fashion them into pocket knives and fashion accessories. Sometimes the steel is recycled to create carving knives for serious craftsmen. It is a disgrace. This is the fate facing what used to be called the Soul of the Samurai. They were heart of the Japanese manor for centuries, enshrined on the tokonoma like a crucifix on the alter. They were the spiritual center of homes. And now they are being cut up and cast away like nails pulled from the sole of a shoe all because the Japanese do not have the right to bear arms. What a pitiful, disgusting fate for the Soul of the Samurai.